Properly practiced, knitting soothes the troubled spirit, and it doesn’t hurt the untroubled spirit either. Elizabeth Zimmermann was born in Devon, England, UK. 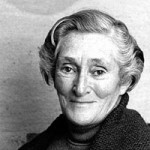 She was a British-American hand knitting teacher, writer, businesswoman, and designer. She revolutionized the modern practice of knitting through her books and instructional series on American public television. Though knitting back and forth on rigid straight needles was the norm, she advocated knitting in the round using flexible circular needles to produce seamless garments and to make it easier to knit intricate patterns. She helped to re-introduce continental style knitting to the United States. Her autobiographical "Digressions" in the book Knitting Around reprinted many of her original artworks alongside the text. She wrote other books, The Opinionated Knitter and Knitting Without Tears.